شیرخانی, علی, رحیمی, مهدی. (1397). بررسی انتقادی موافقان فرا تجدد در ایران. فصلنامه علمی تخصصی سیاست پژوهی, 5(10), 9-37. علی شیرخانی; مهدی رحیمی. "بررسی انتقادی موافقان فرا تجدد در ایران". فصلنامه علمی تخصصی سیاست پژوهی, 5, 10, 1397, 9-37. شیرخانی, علی, رحیمی, مهدی. (1397). 'بررسی انتقادی موافقان فرا تجدد در ایران', فصلنامه علمی تخصصی سیاست پژوهی, 5(10), pp. 9-37. شیرخانی, علی, رحیمی, مهدی. بررسی انتقادی موافقان فرا تجدد در ایران. فصلنامه علمی تخصصی سیاست پژوهی, 1397; 5(10): 9-37. الف. استفاده گزینشی از ابزارهای روش‌شناختی پست‌مدرنیسم برای نیل به مقصود در جریان های موافق، حضور پست‌مدرنیسم را ناقص و به صورتی شبه‌پست مدرن درآورد. ب. پیامدهای این جریان، فارغ از رشد و یا افول سنت، حفظ یا نفی وضع موجود، حاکم شدن نسبیت‌باوری و رشد بی‌مبنایی که ظهور و بروزشان وابسته به مکان‌های جغرافیایی و شرایط فکری و خاص نمی باشد، می‌تواند پیامدهای دیگر مختص زیست بوم ، داشته باشد. این امر در ایران با «روی‌آوری به تفکر» نمایان شد. Postmodernism is more known as a school of thought and a form of thought which has a philosophical critique on the great narratives in the scientific community. Therefore, our interpretation of this category is similar to the point of view of James Ford who denotes postmodernism as a "theoretical discourse." Now, this trend which has a serious place in the historical pathway of Western thought, has come to Iran such as many other currents of thought so that, today's research in the field of postmodernism is considered as one of the most important current trends in contemporary Iran. Accordingly, knowing the flow of supporters, presence of postmodernism in Iran and its consequences are the main subject of the present article. In this regard, the views and attributes related to this process are examined firstly, and then consequences of this presence such as postmodernist traditionalism, dominance of relativism logic, preservation and negation of the present situation, growth of nihilism, and questioning and thinking enthusiasm are mentioned. 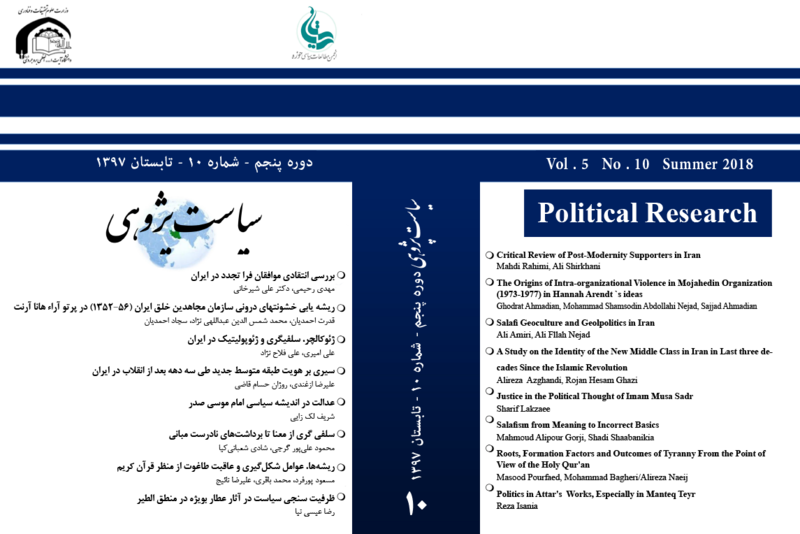 The present paper examines the extent and state of postmodernism in Iran and explores the foundations of its intellectual supporters, to seek the answer of this question that each of the accordant currents which have been effective by benefiting from this school in its strengthening and bolding and its life has defined in relation to this new situation, what are the political-intellectual consequences in the Iranian society? a.The selective use of postmodernist methodological tools to achieve the accordant currents flawed postmodernism presence as incomplete and quasi-postmodernism. b.The consequences of this process, regardless of the growth or decline of tradition, maintenance or rejection of the present situation, dominance of relativism and growth of unfoundedness, whose emergence is not dependent on geographic locations and particular intellectual and specific conditions, can have other consequences specific to the ecosystem. This issue has become apparent in Iran with a "convergence of thinking."